I’ve heard the term “the trend is your friend” thrown about a bit since I started spread betting. If your new to spread betting you may be wondering what does it mean. Well I’ll try and explain it for you. A trend is when a price moves predominantly in one direction. This direction will either be up or down. The reason it moves in one direction is because more and more people joint the trend and so it continues until people feel they’ve had enough of that trend and start to exit their positions in it. Imagine you buy a pair of jeans, three friends of yours like the jeans and go out and buy the same jeans. Another 3 friends of each of your friends also like the jeans and go out and buy the same jeans and so on. You have started a trend for those jeans. Trends occur in every walk of life, whether it’s the latest toy, song in the charts, fashion, TV programs, trends are everywhere and they are big business. How often do you hear kids at Christmas saying they want the latest Toy or game, it’s probably because their friends have the same and they want to be part of that trend. Trends in financial instruments are no different, therefore if you spot a trend it maybe a good idea to follow it, at least until the trend is over. Now this is quite tricky. There are many different ways to identify trends. Some people like to try and identify the start of a trend or turning points in old trends. It can be done, but be prepared to be lose when you get it wrong. Most people will tell you trying to identify the starts of trends is a sure way to the poor house. I think it depends on your view. If you are just starting out with spread betting I would think trying to pick the start of a new trend will be a little advanced, at least until you find your feet anyway. Identifying a trend on a chart or price pattern can be fairly simple. Visually they can be easy to spot. The problem is by the time you’ve spotted the trend it can be almost over. It can also continue on and on and on and the problem you face is when do you enter the trend? An up trend can be defined as price making higher highs and higher lows. If you take a look at my crude drawing below you will see a fictional example of an uptrend labelled Up trend. A down trend can be defined as price making lower highs and lower lows. 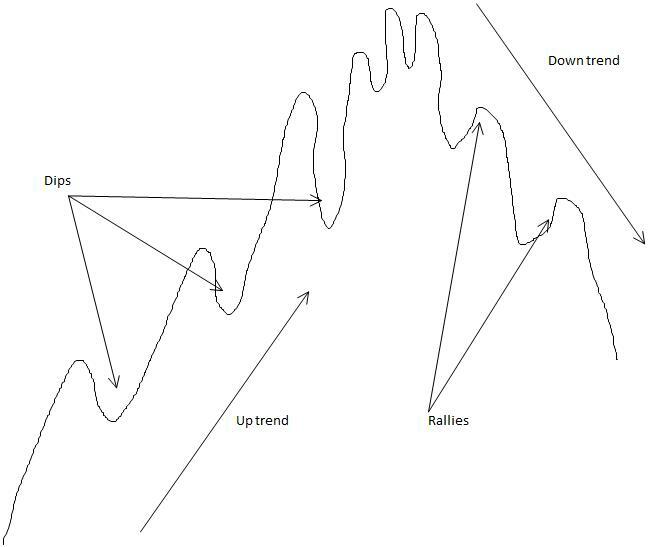 There are many trend following strategies out there and the key them to them all is to buy on the dips for an uptrend and sell on the rallies for a down trend. Sounds easy enough but believe me it isn’t. Malcolm Pryor has some excellent trend following spread betting strategies in both his books,The Financial Spread Betting Handbook: A Guide to Making Money Trading Spread Bets and Winning spread betting strategies: How to make money in the medium term in up, down and sideways markets: Trading Techniques for Active Investors . If you are new to spread betting and need somewhere to start I would highly recommend both of these books. So that’s basically it. In a nutshell “The trend is your Friend” basically means if you develop a trend following strategy and stick to it you hopefully won’t go far wrong. The reality however can be very different.